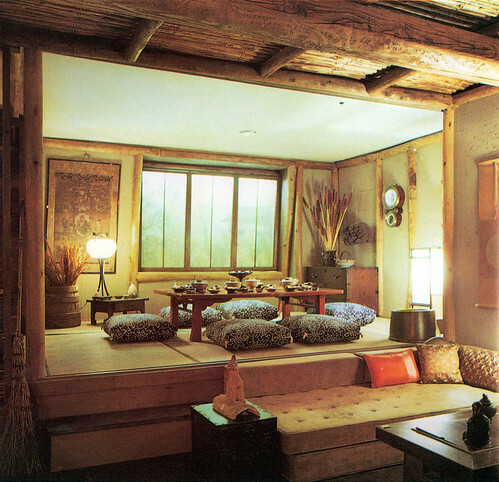 More photos from “The Bloomingdale’s Book of Home Decorating,” 1973, by Barbara D’Arcy. These displays – a Japanese room, a psychedelic red room and a room done in a sort of wild Tudor hunting lodge style – were built inside Bloomingdales in the late 60s or early 70s. See more of the amazing display rooms D’Arcy designed for Bloomingdales in our earlier post, The Saturday Generation. Tags: 1960s, 1970s, 1973, 60s, 70s, Barbara D'Arcy, excess, experience, imaginative excess, lounge, mod, modern, New York, New York City, psychedelic, sensual, The Bloomingdale’s Book of Home Decorating, The Saturday Generation, why are things so boring now?